Two University of Wyoming researchers have found that scaling of cell and nuclear sizes shortly after fertilization contributes to the regulation of gene transcription and cell cycle elongation in African clawed frogs. Such scaling may have future implications for controlling the rate of cancerous growth in human cells. Daniel Levy, a UW assistant professor in the Department of Molecular Biology, and Predrag Jevtic, a UW doctoral student in Molecular and Cellular Life Sciences, investigated how changes in the nuclear size of cells and the nuclear-to-cytoplasmic (N/C) volume ratio during early development of the frog cells contribute to the regulation of the timing of the Midblastula Transition or MBT. The MBT is a transition during the blastula stage of embryonic development in which zygotic gene transcription is activated. Levy is a corresponding writer of a paper, titled “Nuclear-Size Scaling During Xenopus Early Development Contributes to Midblastula Transition Timing,” which was published in the Dec. 4 issue (today) of Current Biology. Jevtic was lead writer of the paper. Current Biology is widely valued among life scientists, and features research and commentary in all areas of biology. “Part of the reason they (Current Biology) liked the paper is that it revisits an old developmental question,” Levy says of the early 1980s discovery of the MBT being the first major transition during embryonic development. “We’re using a modern-day approach,” says Jevtic, originally from Valjevo, Serbia. While previous studies suggested a role for the N/C volume ratio in MBT, none directly tested the effects of altering nuclear size during the development process. Embryos from African clawed frogs were used because its eggs are large, approximately 10 times the size of a mammalian egg, Levy says. Also, frog embryos develop externally and the cells divide rapidly. And, as cells become smaller, so does nuclear size. Approximately 4,000 cells represent the point of the MBT, which is critical for the later stages of embryonic development, Levy says. 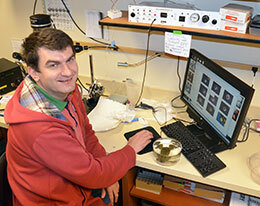 Levy and Jevtic micro-injected frog embryos to over-express proteins of interest. These proteins were catalysts that led to changes in the size of the nucleus. Their research data revealed that, when the size of the nucleus was increased, earlier or premature gene expression occurred, Jevtic say. On the flip side, when nuclear size was decreased, the two observed delayed zygotic gene expression. Hear molecular biologist Daniel Levy explain how this cell research has implications for controlling cancerous growth in human cells.